For my reference class, we’re required to review and evaluate many different types of sources throughout the semester. This week, we had a trial run: an assignment to choose a single work in the Simmons library reference collection and review it. This process is something that reference librarians do constantly, either systematically (in recommending acquisitions for reference collections) or more improvisationally (when assisting patrons in answering reference questions). At the MHS, all of us on the Reader Services Staff take our turn highlighting a reference work in our collection as part of an ongoing “reference book of the week” project. For those of you who are interested in what goes into such an evaluation, below is the assignment I did this week for class. Walter, Lynn. The Greenwood Encyclopedia of Women’s Issues Worldwide. Westport, Conn.: Greenwood Press, 2003. The Greenwood Encyclopedia of Women’s Issues Worldwide provides researchers with an easily-navigable overview of contemporary women’s issues across the globe. The work is organized in six volumes by geographical region (Asia and Oceania, Central and South America, Europe, The Middle East and North Africa, North America and the Caribbean, and Sub-Saharan Africa). Within each volume, the contents are arranged alphabetically by country, or group of countries, profiled. Each volume was edited by a scholar who is an authority on the region, and contributors are drawn from predominantly American universities, with a healthy representation of individuals at institutions of higher education across the globe. Each contributor was asked to profile her or his assigned country, or group of countries, with an eye toward “locating women’s agendas,” “differences among women” within the region, and the activities of self-identified women’s movements and non-governmental organizations. Each author follows the same outline, covering uniform topics that fall under the broad categories of “education,” “employment and the economy,” “family and sexuality,” “health,” “politics and law,” “religion and spirituality,” “violence,” and “outlook for the twenty-first century.” The summary narrative is augmented by a selected bibliography and resource guide within each chapter that points the researcher to further information in suggested readings, audio-visual and Internet material, and organizations of note. With each chapter laid out in the same basic pattern, it is fairly simple for the researcher to cross-reference subjects such as “contraception and abortion” to find out how access to birth control varies depending on whether one lives in Denmark, the United States, or South Africa. Each volume contains a subject and person index for that volume, with a comprehensive index found at the end of volume six. Maps and images are included, though not in color, and are not indicated in a separate index. 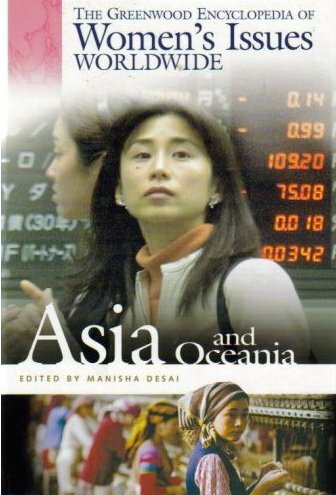 Appendices in each volume provide statistical information on the education, health, economic status, and political participation of women in the region. Reviewing the encyclopedia for Choice Reviews Online in May 2004, P. Palmer describes the work as “current, well written, and informative, providing scholarly content, useful detail, and sound documentation.” Sally Moffitt, reviewing for Reference & User Services Quarterly, highlights the ease of cross-country comparisons and points out that “it will be a matter of regret if its editors fail to bring out regularly updated editions.” Indeed, since it was published in 2003 the Encyclopedia of Women’s Issues is now five years out of date as a truly contemporary source of information on global women’s issues. However, it remains the most recently-published resource attempting this level of breadth and depth, and is a valuable tool for both entry-level students of women’s studies as well as higher-level researchers seeking comparative data the status and experience of women worldwide. The target audience is students and faculty in higher education, although high school students with a particular research need will also find it accessible and informative. P. Palmer, review of The Greenwood Encyclopedia of Women’s Issues Worldwide, by Lynn Walter, Choice Reviews Online (May 2004). Available online at http://0-www.cro2.org.library.simmons.edu/default.aspx?page=reviewdisplay&pid=2658010. Accessed 27 September 2008. Sally Moffitt, review of The Greenwood Encyclopedia of Women’s Issues Worldwide, by Lynn Walter, Reference & User Services Quarterly vol. 43, no. 4 (Summer 2004): 348-349.